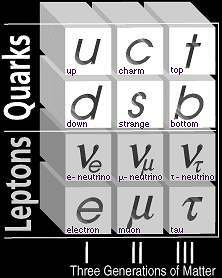 Quarks and leptons are the major atomic particle building blocks of the universe. The muon is in the bottom, center row. Image courtesy Fermi National Laboratory. January 17, 2004 Urbana-Champaign, Illinois - Not everyone is certain that Supersymmetry of super atomic particles is the answer to Dark Matter. In fact, some theoretical physicists argue about whether the Brookhaven muon magnetic moment measurement is even a meaningful discrepancy.